To celebration more than 100,000 pageviews, The Informed Illustrator presents the letter ‘C’ of The Illustrator’s Reprehensible Dictionary. 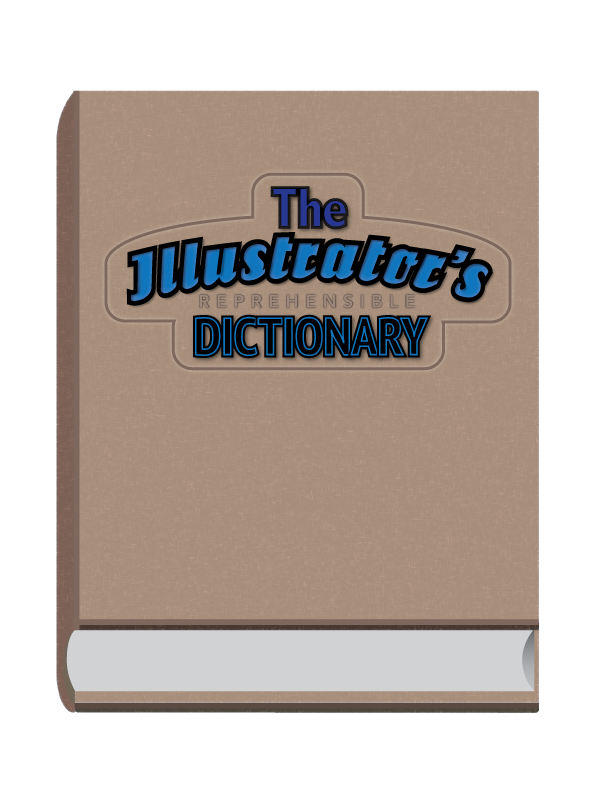 The dictionary was conceived to answer a desperate need for the language of illustration to be defined. Additional installments will appear at irregular intervals over an interminably long period of time. This installment was procrastinated on for over a year. 3. a fancy word for the lost art of handwriting. 4. a term describing the actions of an illustrator making cold calls in search of a commission. 4. art that exaggerates the defects and peculiarities of a person while simultaneously displaying the defects and peculiarities of the artist creating it. 4. something an illustrator never wants their illustration to be called. 3. a comic book hero no one has ever seen. 3. something that leaves a filthy mess on a scanner. 3. a brand of clothing worn by reps and hipsters. 3. a measure of intensity used to describe the degree of anger in a client’s face. 3. another form of booing or casting insults. 3. the first suggestion a client has on an assignment. 3. a class of people who believe themselves above other classes of people. 4. for a client to have forced an illustrator to make changes to a finished illustration. 4. art composed of elements not created by the artist creating the art. 4. a facial characteristic of an enraged client. 4. a procedure a client uses to torture an illustrator. 3. a skill not very many artists are good at. 1. an improper use of the word. 4. something previously thought to be part of all illustrations. 3. a person who shows great appreciation for something by disliking it. 3. the only medium a first-year art student is allowed to use. 4. all fashion illustration, no matter when it was done. 3. a determining factor that may have to do with a client and have nothing whatsoever to do with the illustrator or illustration. 3. acknowledging the edge of ones drawing capabilities. 3. a state of détente between illustrator and client. 3. describing a person who is forced to only use the right side of his or her brain because they don’t have a left side. 3. a non-religious form of tithing. 2. a drawing method that uses twice as much lead as necessary. I’d like to acknowledge the following individuals who provided inspiration for this project. G.K.C., L.T., B.A., B.D., B.H., J.P., G.H., B.F., and T.L.